Mei Tais, Podaegis (“Pod”), and Onbuhimos (“Onbu”)…these are all types of Asian-inspired baby carriers and offer babywearers some really amazing options for carrying their children on their front or back! They are perfect for newborns and are ideal for toddlerhood for back carries. In their simplest form, each of these carriers are essentially a rectangular cloth body with three different strap options depending on whether you will be using a Mei Tai, a Pod, or an Onbu. Mei Tais are the most popular (and widely available) of the Asian-inspired carriers, so we will mostly discuss those. Information on Pods and Onbus can be found at the bottom of this post! What is a Mei Tai? “Mei Tais are a traditional Chinese baby carrier. In its very simplest form, a Mei Tai is a rectangular cloth body with straps coming off of each corner. Modern manufacturers have each developed their own take on this traditional design, so there is a wide variety of designs available…from wider panels, to padded straps, to custom creations made using woven wraps…the possibilities are endless for these amazingly functional and versatile baby carriers. Mei Tais are most easily used for front and back carries (although they can be used for hip carries as well). Back carries can be done at varying heights (younger babies need a high back carry). They are easily transferred between wearers and provide a “custom” fit as they are tied onto the wearer and just live a woven wrap, adjust without buckles based on the wearer’s size. Mei Tais are a good middle ground for someone who likes the custom fit that using a wrap offers but wants the speed and ease of a soft structured carrier. • Wrap Style Straps: These straps are un-padded and are worn on the shoulders much like a wrap would be. • Padded Straps: These straps have some amount of padding on the part of the strap that goes over the shoulder. The rest of the strap is the same width but without padding. • Padded to Wrap Straps: Found primarily on wrap conversions, padded to wrap straps start with padded shoulders but fan out to wrap width. Bamberoo’s “Hybrid” straps, Ocah’s “Duo” and “Harmony” straps, and ObiMama’s “Kombi” and “Zen” straps fall into this category. • Un-padded: No padding on the waist. • Padded: Some level of padding on the waist; padding may only be as wide as the body or may extend somewhat around the curve of the waist. • Structured: Some mei tai makers offer a more structured waist like those found on soft structured carriers. These often have buckles; carriers with a buckle waist and tie straps are often referred to as half buckles. • Material: Most wraps are made from natural fiber materials; straps and inner bodies are generally heavy material like canvas. Most have coverings of print fabric. Some manufactures offer Solarveil carriers and others offer Wrap Conversions (either the body or the entire mei tai made from a woven wrap). • Size: Some manufacturers offer different body sizes such as infant, standard, or toddler – check the measurements provided by the maker or ask if you are unsure about sizing. Other brands come in one size that is intended for all age babies/toddlers (although no Mei Tai offers a perfect fit from newborn to preschooler). Mei Tai width measurements are taken across the top of the waist band; height is measured from the top of the waistband to the top of the center of the carrier (usually it is specified if this measurement does or doesn’t include the headrest). • Hoods and Headrests: Many Mei Tais offer hoods and/or headrests that can be used to support a baby’s head as she sleeps. Some hoods can be tucked into the Mei Tai or removed when not in use. Some are flat style and others designed like a sweatshirt hood. An Onbuimo or “Onbu” is very similar to a Mai Tai, but instead of both shoulder and waist straps, it has shoulder straps and a pair of rings at the waist. The straps go over the wearer’s shoulders, then through the rings. 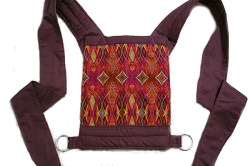 A Podeagi, or “Pod”is a traditional Korean-inspired Asian baby carrier that is also similar to a Mei Tai. 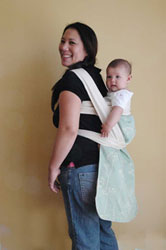 Unlike a Mei Tai, a Podaegi only has two straps, located at the top of the carrier. It can have either a large, blanket like body, or a narrower body similar to a Mei Tai in size. As a back carrier, the Pod is ideal for use with pregnant moms or moms who are still recovering from a c-section as there is not a waist strap and can be safely secured using the shoulder straps. 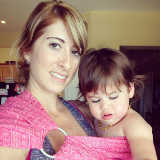 …and for videos on how to use Mei Tais and other Asian-inspired baby carriers!! Tucson Babywearers loves that you are choosing to keep your baby close, and understand that some carriers seem out of reach due to cost and attainability (for those on a budget), or want of a custom carrier (when many of the more popular custom carrier makers are booked solid!). 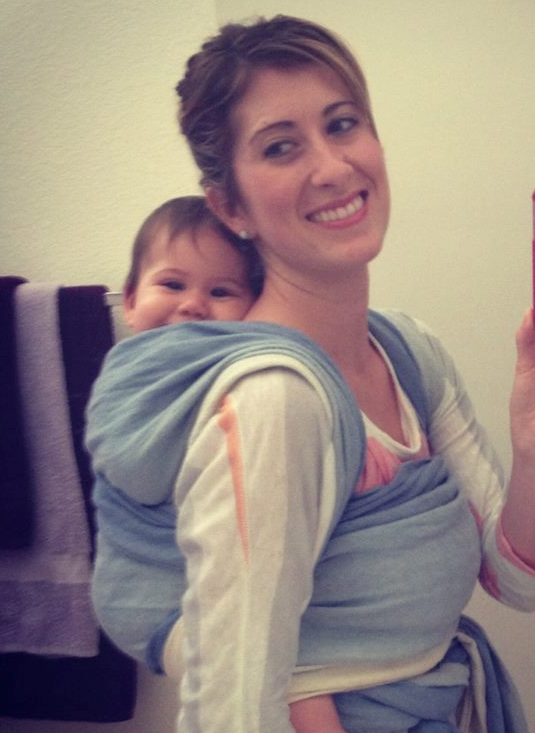 Many babywearers turn to local, micro-businesses for these options (otherwise known as WAHMs (work-at-home-moms), and we just want to take a moment and provide you with some general guidelines on what to look for when considering a WAHM-made and/or handmade carrier. “There are many fantastic work at home moms (WAHMs) who make quality baby carriers, both on a small scale and a large scale. There are, however, certain things to look for from both a safety and a legal standpoint. ■ What materials do you use? What kind of rings do you use (if it is a ring sling/carrier with a ring waist)? How many rows of stitching do you use? Be aware that phrases like “100% cotton” are vague. Quilter’s cotton, for example, is not a recommended material to use in baby carriers. Fabric comes in various weights and quality– some may be safe, some may not. Don’t be afraid to ask for specifics. Ask how many layers are used. Ask what thread is used. Check the link above to Jan’s site to make sure the materials used are safe. ■ How long have you been making carriers? Please note that just because someone is new doesn’t mean they don’t know what they are doing. However, some WAHMs have been doing this for 15+ years and completely adhere to the highest level of safety and quality. Even an experienced seamstress might not take into consideration some safety aspects that are specific to baby carriers. A baby carrier must hold up to a lot of weight and use. It’s quite different than making a dress. ■ Are you CPSIA compliant? Do your products come with tags and registration cards with all the necessary information? Please see the link above to the BCIA site to find out specifics on the current requirements. Please note that just because someone is part of the BCIA does not necessarily mean their products are safe or compliant. ■ What is your return policy if I am not happy with the product? Look for a business that stands by their product and will accept returns within a reasonable time frame if you are not satisfied with the construction of the carrier. Read reviews! We have reviews here: https://www.facebook.com/groups/Babywearing102/doc/488323047922545/ but also check reviews on the Babywearing Retailer/WAHM group (https://www.facebook.com/groups/BabywearingRetailerWAHMReview/) as well as on TheBabywearer.com (Product Reviews here: http://www.thebabywearer.com/cgi-bin/reviews/review.pl?product and Vendor Reviews here: http://www.thebabywearer.com/cgi-bin/reviews/review.pl?vendor.All). Don’t forget to leave an honest review once you receive a product! As always, please don’t hesitate to contact us on the Tucson Babywearers Facebook page with any questions or concerns about WAHM-made carriers!! This week’s carry is one of the most popular (and supportive) back carries. The Double Hammock (DH) – also called a Chunei Back Carry – is a great back carry that keeps both toddlers and babies nice and secure, and most woven wrap babywearers will tell you how much they love a Double Hammock! This carry uses a longer wrap and includes two rebozo passes across baby’s back, a horizontal chest pass, and ruck-style shoulder straps. Why we like it…the Double Hammock centers the weight to your chest so you aren’t using just your shoulders for support. 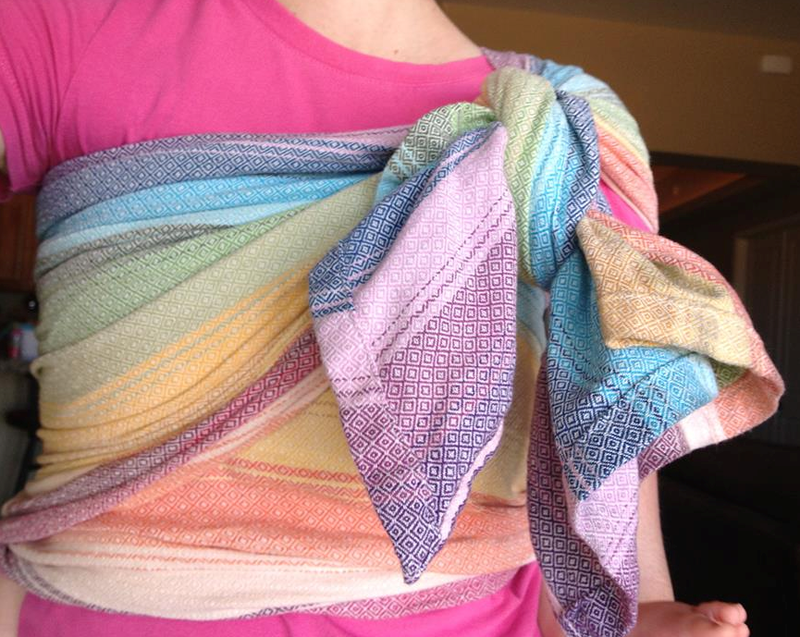 It’s multilayered, making it fabulous to support a heavier child or carry for lengthy periods of time. The DH is also great for those wiggle worms and ideal for small babies and bigger ones alike. Generally considered one of the most comfortable carries, the Double Hammock has a bit of a learning curve, but it’s one back carry definitely worth learning! The key to a good Double Hammock is a nice snug chest pass. It may take a few tries, but once you get this carry down, you’ll love the support it gives! We have featured not only the classic carry to learn and review, but also a few interesting variations and finishes. A different finish or chest belt can redistribute weight and change the feel of the entire carry. Try it out and let us know what you think! Check back in next week to see what wrap carry we’ll feature next! Safety: Stretchy/Knit Wraps must not be used for Back Carries. Please keep in mind that if this is your first time doing a back carry, or even this particular carry, you should have a spotter and/or practice over a soft surface such as a bed or a couch. You can even practice with a doll or stuffed animal first until you feel comfortable. As a group, we at Tucson Babywearers are in agreement with the ideas expressed in this article…babywearing is not just about which carrier you choose to use, it is about keeping your baby close and wearing your baby safely. That is all. Simple as that. We do feel that many carriers are more comfortable than others and would love to show you what options might work best for your family, but we do not wish to exclude or judge any parent based upon the carrier they have right now, at this moment. We think it is beautiful that you have made the choice to have your little one close…to hear your heartbeat and to feel your warmth, and we wholeheartedly support you on this journey into babywearing! 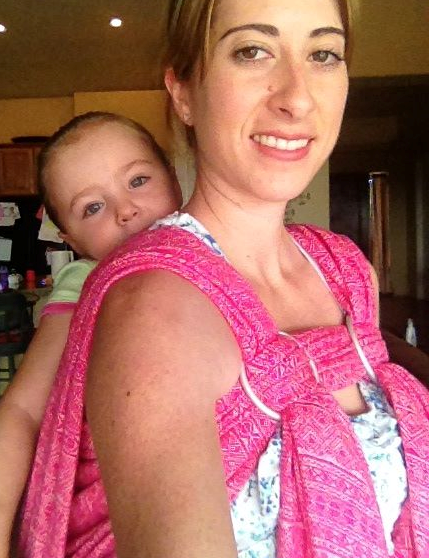 Check out this amazing collaboration from the Facebook group, Babywearing 102! Tucson Babywearer’s is also proud to say that two of our members, Cybil and Chyna, were a part of making this fabulous project happen, and we couldn’t be more excited! “Wrapping 360” is a pictorial illustrating some of the most common woven wrap carries from all angles including clickable links to videos and tutorials for the individual carries. Click on the link below for a full view of the Wrapping 360 PDF file and let us know what you think! This week’s carry is the Robin’s Hip Carry (RHC). Hip carries are a great option for many babywearers, and are great to use for infants (with head control) and toddlers alike. Many wearers find hip carries a little less challenging to wrap than back carries, and love the fact that it is easier to accomplish many tasks that can be frustrating due to an obstructed view in a front carry. Hip carries are also a great solution to the “my baby likes to face out” problem that many parents experience. Like a high back carry, a hip carry allows baby to see out, but also provides a safe and natural retreat against the parent’s (or caregiver’s) chest when they start to experience too much stimulation or become sleepy. Robin’s Hip Carry (RHC) is a great carry for shorter durations, and for babies who can sit on their own. This carry is quite versatile since you can use a longer wrap (6 or 7) and tie in back, a shorter wrap (3 or 4) and tie under bum. RHC may look a little complicated, but it is fairly quick and easy to learn. It is also a comfortable and easy carry to nurse in and for laying down a sleeping baby. 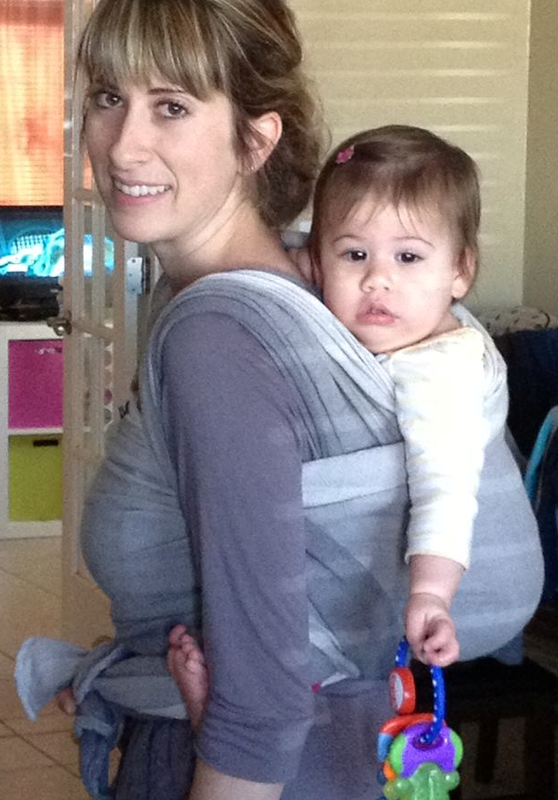 RHC can be modified to a front carry (tummy-to-tummy), and also has a variation using a sling ring. The key to the RHC is getting the shoulder/back passes smooth and evenly spread, and placing the “anchor point” high to achieve optimal comfort and to protects against leaning. Similar to a ring sling, the anchor point – where the wrap crosses/twists at the shoulder – should be where one would wear a brooch or pin (between collar bone and top of breast). Try it out and let us know what you think…and be sure to come back next week to see what wrap carry we’ll feature next! Happy Babywearing! New to babywearing or a seasoned veteran?? 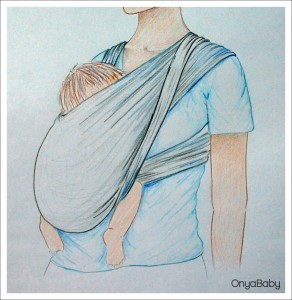 Read and share this wonderful blog post about the Biomechanics of Babywearing from Onya Baby about proper positioning!